Sew, Stamp, Stitch: Block 2 already! 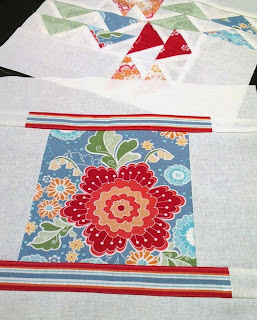 I was very excited about having my first block completed in the Modern Blocks Quilt-a-long that I visited And Sew We Craft early yesterday to see Block 2 and this afternoon got to work cutting and piecing. 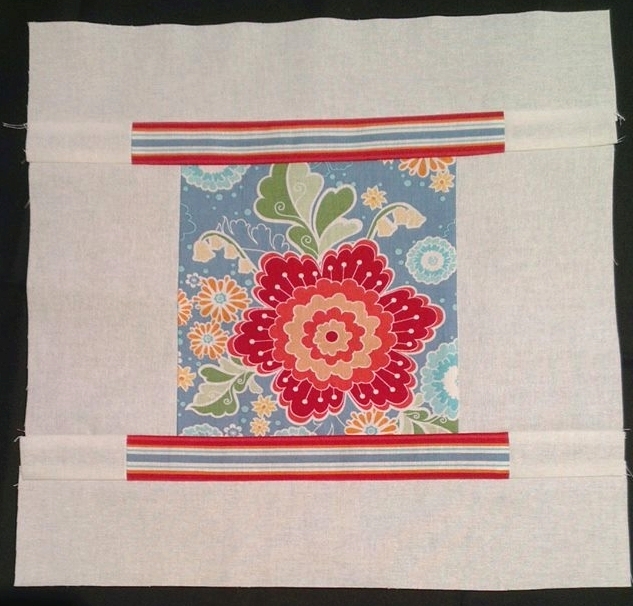 This block was chosen by Tonya at The Crafty Mummy, head over to her blog for the instructions. I wanted to show off one of these gorgeous flowers on this print, so I made sure it was in the square I cut for the large piece. And I chose the striped fabric for the ends of the 'spool' because I felt they would fit in with that shape. It was also handy to help my sew straighter for those thinner pieces to have the stripes to guide me! 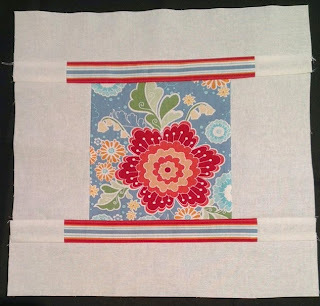 If you look closely, you can see I used the blue floral fabric in the Follow the Leader Block, but the small size of the triangle didn't allow much of the flower to be shown, so it's nice to be able to do that on this one. I am also starting another block for a Mystery Block of the month quilt that I purchased a kit for. I have blocks 1 and 2 so far and am about halfway through piecing Block 1. It's kind of exciting because when you purchase the kit you get a variety of fabrics (in a colourway that you can select, mine was blues and greens) and then you put it together, so I suspect it will be a lovely scrappy kind of quilt when I am done, and the great part is I won't have to worry about choosing the fabrics, just go with what arrives! Hope to share the finished block soon! Love your fabric!!!!!! The stripes look fab and the flower is gorgeous! Love love love your fabric!